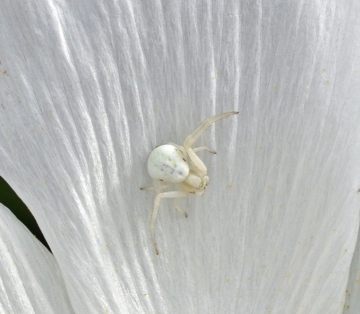 Misumena vatia is a distinctive crab spider found in gardens as well as in tall open grassland, woodland edge and open scrub habitats in the southern half of Britain only. Its body shape, legs and movements are typical of crab spiders. The front two pairs of legs are very conspicuously longer than the back two pairs and the carapace is angular, making the spider crab-like both in appearance and in its ability to move sideways. 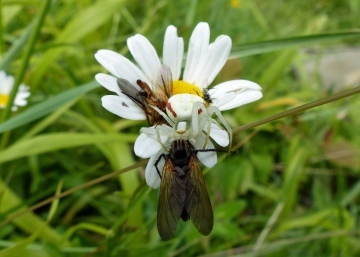 The best distinguishing features of this crab spider are its cryptic body colour, together with its habit of sitting camouflaged in flower heads, where it waits to ambush pollinating insects. 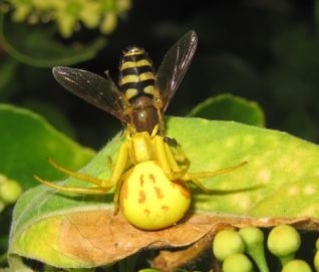 Mature females are distinctive although the body and leg colour vary from pure white through to yellow or greenish, sometime with pink spots or lateral abdominal stripes; the carapace has a broad white median band, usually with olive-green lateral bands on either side. These females can undergo slow, background-matching colour changes. Males have a body shape generally similar to those of females, but they are smaller with predominantly brown legs. Unlike the adult females, they cannot change their colouration. Adults of both sexes have been recorded between May and August, but mainly in May and June.